Wine barrels. Acharya, S. (2008). Oaks are well renowned as the finest hardwoods because of their strength and durability and, thus, they have a diverse range of industrial uses. Oaks been used for furniture, bridges, ships, and many other types of construction. However, the lumber from the Northern Red Oak is not has fine as that from its relative, the White Oak. The wood of Oaks has been used for winemaking back to classical times. 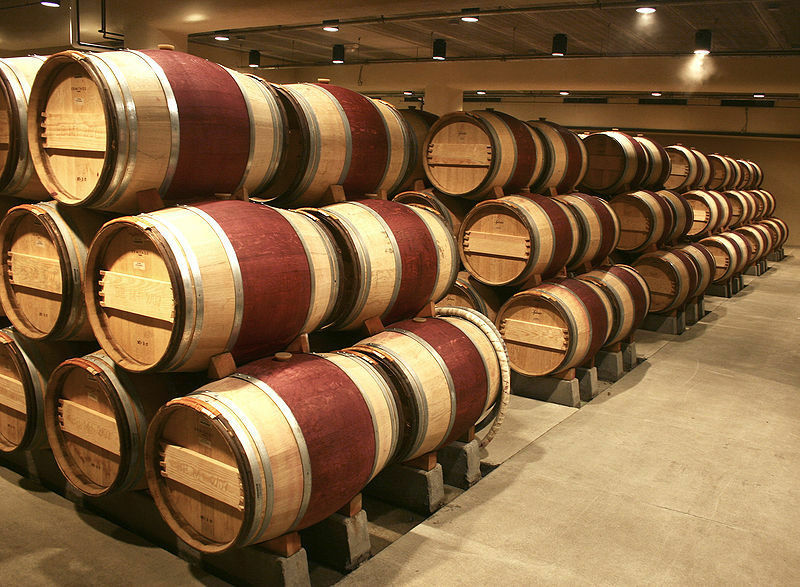 The Romans knew that Oak’s characteristics made it ideal for constructing barrels or vats. Not only has it been used for its construction capabilities, but also the wood itself is able to impart an added flavor dimension to the wine. The slower the growth of the tree, the tighter the grain. This enhances the flavor of the wine because more of the desirable phenols can be extracted. Since, the Northern Red Oak is not particularly slow growing, other varieties of oak are favored. Further, cork for wine bottles can be obtained from the bark of the Oak tree. The trees are first stripped at 20 years and then at 9-year intervals. The stripped bark is dried and boiled to remove impurities and to soften it. Oaks are susceptible to invaders while they are growing, such as insects and fungi. Certain insects can even cause galls to form on the tree. However, these galls are of economic importance because many contain a compound called tannin. The term tannin comes from “tanna,” an Old High German work for Oak tree. Wood tannins from Oak are used for tanning animal hides into leather; hence the words “tan” or “tanning” refer to the treatment of leather. Tannins produce colors when treated with ferric chloride and have been used to produce the blue-black type of ink used in fountain pens. Just think, the pens in your backpack could have been derived from the tannins of the Northern Red Oak! These tannins are extracted by chopping the gall into pieces, cooking them, and then isolating the tannins in the steam. Northern Red Oaks are widely utilized in landscaping because of their amazing adaptability. They remain extremely hardy, even in urban conditions, because Northern Red Oaks are tolerant to dry and acidic soil as well as air pollution. This Oak is fast growing and easy to transplant, making it an ideal candidate for city parks. The Northern Red Oak is also prized for its beauty. In the summer and spring, their numerous leaves create the wonderful canopy of shade. In the fall, the leaves of the Northern Red Oak leaves develop a beautiful brick-red fall color and the acorns attract wildlife.